A total of $1,199,414 was granted to three contractors for projects to help provide services to people in rural areas. 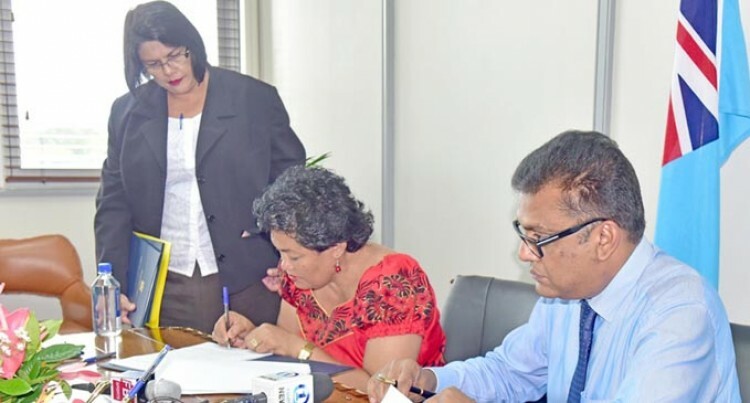 The signing of agreements was held at the Office of the Prime Minister yesterday by Permanent Secretary Yogesh Karan. Mr Karan said the signing of the agreement with the contractors was part of the Prime Minister’s commitment to respond to such needs. He said: “One of the agreements granted to Chand Engineering Consultants is to build a four classroom block and three staff quarters at Vuanisaiki Primary School in Cakaudrove. He said the project cost of the construction at Vuanisaiki Primary School was a significant one, valued at $1,140,000. “I warmly congratulate the contractors to take up the projects and we are vying to see the project is successfully completed with all standards and quality maintained,” Mr Karan said. “We will be closely monitoring this with the Construction Unit at the Ministry of Economy. “It has been a long process, tenders vetted by the Ministry of Economy and we thank everyone for coming forward and taking up the projects,” Mr Karan said. The second tender with a total of $32,414.80 grant was awarded to Building Friendly Resilient to construct a four pan ablution block at Navala Village in Ba. A total of $16,000 was granted to Shankar and Sons Transport and Digging Works to carry out drainage works at Ratu Filise Memorial School at Namatakula Village in Nadroga/Navosa.